I applaud that list, but he is in true proto-geek fashion running entirely against the trend. When the ChildFund Alliance surveyed children around the world, most children in developed countries wanted to become either a professional athlete or a performing artist. Modern technology or science based professions simply didn’t get a look-in. But at the same time when asked what they would do as a president to improve children’s lives, the universal answer was that they would improve education – more sports classes perhaps? I understand kids see the excitement of being an athlete or a rock star; but, really, we’re pitching science all wrong when more kids want to join the police or take a job in a service industry than aspire to be a scientist. 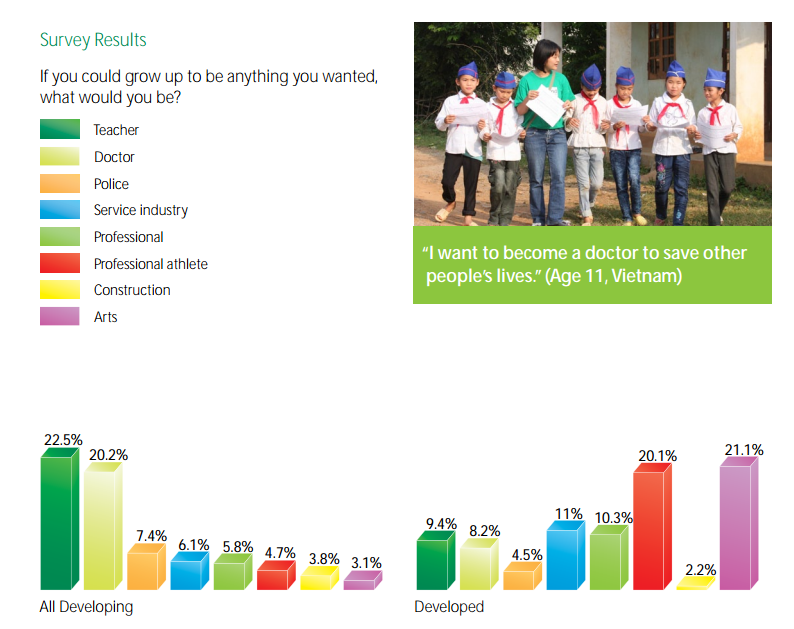 Another facet of the report that I found interesting was when the same question about what you want to be when you grow up was directed at children in developing countries they overwhelmingly wanted to be a teacher or a doctor. I’m guessing that reflects the people having the greatest influence on their lives as well as a highly visible aspirational step. I wouldn’t characterise the Report as giving any deeply shocking insights, but sometimes it’s good to have a study provide evidence for what you might have guessed anyway. And there are some unexpected responses in the Report. Kids in Sri Lanka are apparently not worried about much; New Zealand kids are apparently a hungry lot, rating making more food available as more significant than improving education; and in Laos most kids aspire to be a car, truck or bicycle owner when they grow up. The Report, entitled Small Voices, Big Dreams can be found here. Note: I found this thanks to an article in today’s Sydney Morning Herald but I can’t find it reproduced on their website to link to.